Description: Images of Judas across the centuries of Christian interpretation predominantly depict him as an object of horror and condemnation. Some modern interpreters have argued, however, that details about Judas in the canonical Gospels, such as his remorse and suicide, are tragic elements that vindicate Judas, to some extent at least. In addition, the recent discovery of the Gospel of Judas has provided further evidence that even in antiquity there were widely differing views of Judas. The question of the characterization of Judas in early Christianity remains open. Ancient rhetorical handbooks and countless examples from the literature of the Greco-Roman period reveal that death-accounts were regarded as fertile opportunities for shaping the characterization of a figure. Authors and audiences shared the expectation that the manner of a person�s death revealed character. This insight provides a new window into the interpretation of Judas in the early Christian era, since three accounts of the death of Judas have survived from before 150 CE through the Gospel of Matthew, the Acts of the Apostles, and the fragments of Papias. Strategies for encomium and invective, and other elements of Greco-Roman and Jewish literary portraiture, vividly reveal the character-shaping significance of the details in the accounts of Judas�s death. His final words, final actions, and the mode of his death�whether suicide by hanging, falling headlong and bursting, or swelling to the size of a wagon�all would have been understood to signify Judas�s inner qualities and indicate his moral worth. To ancient auditors, the characterization of Judas in these texts could lead only to the assessment of Jesus, �Woe to that one by whom the Son of Man is betrayed! It would have been better for that one not to have been born� (Matt. 26.24). 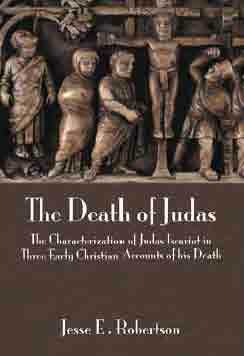 Citation: Lee M. Jefferson, review of Jesse E. Robertson, The Death of Judas: The Characterization of Judas Iscariot in Three Early Christian Accounts of his Death, Review of Biblical Literature [http://www.bookreviews.org] (2015).